Sheets are required to place your 360° photos and tie them to a location. Learn how to upload them on-the-go. Take a photo: Use your mobile device’s camera to take a picture of a sheet. Pick a file: Pick an image or pdf file saved on your smartphone to use as a sheet (on Android devices).Please note that on iOS devices the “Pick a file” option only links to your photo gallery. To choose a PDF as a sheet, you first need to load the PDF on the iOS device (from a PC, download etc.). Then, open the file and share it to JobWalk app. This will execute by pointing back to the JobWalk screen with the sheet; ready to start taking photos. You can apply this solution to multiple sheets, also. 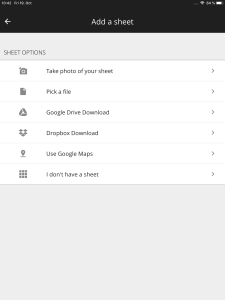 Download from Google Drive: Log into your Google Drive account and choose an image or pdf file to use as a sheet. Download from Dropbox: Log into your Dropbox account and choose an image or pdf file to use as a sheet. Use Google Maps: Either allow automatic position tracking or find the position of your site in Google Maps and crop the portion you want to use as a sheet. I don’t have a sheet available: Use our provided grid as a sheet replacement if you do not yet have one. Note that it is possible to replace the sheet later on in the HoloBuilder editor. Once you have uploaded one or multiple sheets you can continue by taking 360° photos and create a virtual tour.